These little muffins are a real breakfast treat. They can be made ahead and reheated or served at room temperature. They also freeze and travel nicely. They are a nice brunch item. The quantities vary based on how many muffins you are making. I like to cook the sausage the night before. Brown sausage and chopped onions in pan. Drain off excess fat. Mix eggs and pepper in a bowl and set aside. I don’t add salt because the sausage seems to have enough already. Spray cupcake tin with nonstick spray. Place 1/3 of a muffin in each space and press down. Add a spoonful of cooked sausage and a sprinkle of cheese. Fill the tin with the scrambled egg mixture to about the top. Bake according to the biscuit directions. 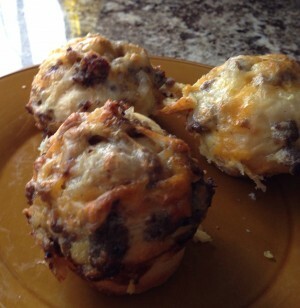 These sausage breakfast muffins are delicious. They are great from breakfast on the go! Thanks for the great idea.